I made this Costume because my 10 year old Son is currently obsessed with Fortnite. Of course he picks a rare skin. 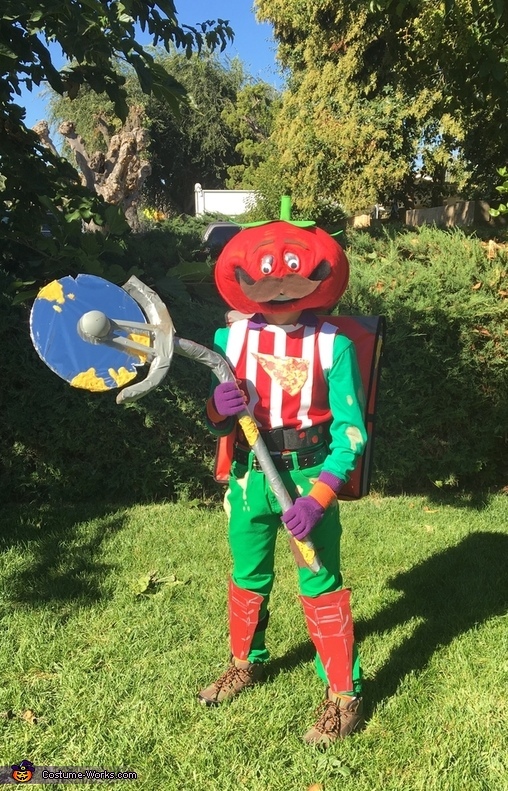 All I did to make the tomato head was buy cushion foam it came in a 4pk, Red felt about a yard and 1/2, green foam for the leaves and stem,at Walmart I then measured how big I wanted the head then cut a pattern to make a sphere. You can google a pattern. Only thing I did different was add 2 more of the cutouts. I got glued them together to make the sphere, I left the bottom open for the head I cut the opening a little bigger. I then got the red felt and just tried to make it as smooth as possible using first spray adhesive and then when I liked the look hot glued it to the head. For the eyes I cut out holes glued poster board in them to make the holes bigger, then cut a clear Xmas ball in the size of the eye glued a google eye in it and hot glued it, i used brown felt for the mustache and eyebrows and black felt for the mouth. For the red shirt I just got a tight red T-shirt ironed on some white stripes, and cut off the sleeves. I bought the green pants and green long sleeve and purple fingerless gloves and belts (utliity and double holed) off amazon. I painted the stains on with acrylic paint. Bought the boots for 5$ off Poshmark and made the shin guards pilot of cardboard and a scorer pen and grey duct tape some elastic glued to the back so it can stay on and a black ribbon or belt to tie around one of the shin guards. I made the pizza cutter out of poster board and hot glue gun I used a wrapping paper tube for the handle and shiny cellophane for the blade. I got glued cheese on it and my son painted it. The pizza bag was also purchased on amazon for @6$ I just painted on the details and hot glued cheese and painted it used some leftover pizza boxes. It took me a week here and there to complete the whole look after everything I ordered came in I wanna estimate the total I spent at 70$. But I could have saved a lot more looking for the stuff earlier like at thrift stores or even ordering from places that take longer to deliver but the price is half what I paid to get them delivered in a couple days. I really enjoyed the looknon my sons face when he put it on the first and every time after that. I’ve gotten a lot of compliments on it so my son said we should enter it in a contest. Cant wait to see all the rest of them! And the bus!